The latest Z-series Android smartphone from the house of Motorola is the Moto Z3 Play. The device presents an aluminium frame, so it weighs light and one can carry it around easily. The Android smartphone features a classy look too. The price of the Motorola Moto Z3 Play price in India begins at INR 18,999 and is due to be rolled out in March 2018. The Motorola Moto Z3 Play is sold in different colour options such as Blue and Gold. Talking about hardware, the device draws power from a Qualcomm Snapdragon chipset. This is coupled with 4GB RAM to promise a seamless and smooth smartphone experience. One can as well enjoy a lag-less gaming experience on this latest Moto device. On the software front, the Moto Z3 Play boots on the Android 8.0 Oreo operating system. The Moto Z3 Play is armed with dual 12+8 Megapixel back shooters. This can shoot great pictures and videos in both bright and dark conditions. To support photos in dark conditions, a dual-tone LED flash is available for the rear camera. 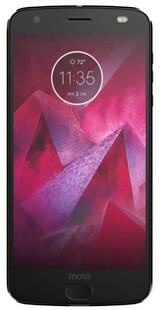 As well, to snap selfies and do video telephony, the Moto Z3 Play features a 5 Megapixel front-facing snapper which is as well supported with a dual-tone LED flash. Taking a cue from Sony, the fingerprint reader is housed on the side rather than at the rear or front. One has the choice of storing multiple fingerprints. In addition to this, the Moto Z3 Play is dust and splash resistant. At its face, the handset flaunts a 6-inch Full HD+ display which uses Super AMOLED technology. The display is bright and outputs vivid colours. The handset offers awesome outdoor legibility even in bright sunlight. As well, you get Corning Gorilla Glass protection which ensures a scratch free screen. The Moto Z3 Play comes with a memory storage space of 32/64GB which can be upgraded further based on user needs via a microSD card up to 256GB. Hence, you have ample space to accommodate apps and also fit in all your media files and presentations. The handset ships with a non-removable 4,000mAh Li-Ion battery. The battery on the Android smartphone is adequate to last for a whole day. Heavy users need not bother, as there is an option for fast charging support also. Motorola has always been known as the company that never compromises on the phone quality. The same trend continues with the Moto Z3 Play. With a robust configuration, nice display and awesome battery, this one turns out to be a superb handset. However, the main attraction has been its amazing camera performance. So, if you are planning to buy a powerful handset, which has the finest camera as well, consider this one. It is certainly a good deal. Motorola Moto Z3 Play full specs and reviews as of Apr 2019. Buy it here!